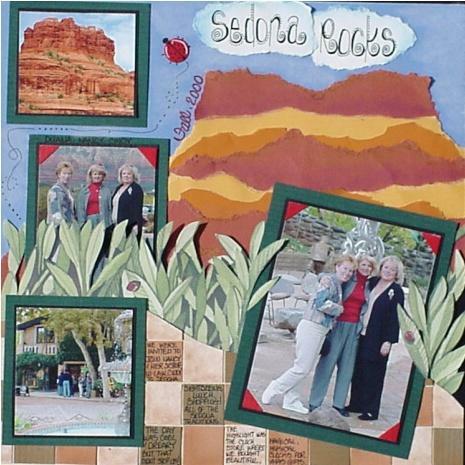 You can't have a Sedona layout without featuring the red rocks but we had more fun shopping and having lunch than we did looking at the scenery. I used the torn paper technique combining cardstock and vellum which I chalked, to create the rocks. The tile "floor" was made with small squares of cardstock that I chalked for shadow and depth. The greenery was cut from a sheet of printed paper. Then I tore and chalked the clouds for the title. Everything looked pretty but needed some punch, so I added the red photo corners to echo my friend's sweater and made a small red ladybug that just happened to be printed on the leaves. It was just enough without being too distracting, don't you agree?